Started and gave up. Just couldn't believe the overall premise. Plus, it was just overly dense. Meh. 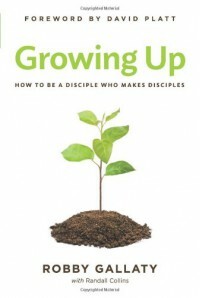 Growing Up is the first in what will be a series of books aimed at being used as a resource in discipleship groups - Gallaty's church calls them D-Groups. As I was reading the book, I couldn’t help feel like I was actually reading a compilation of many different, time-tested and well-known discipleship resources, quotes and tools. From Jerry Fine’s One on One with God to Avery Willis’ MasterLife to Navigators materials to Fighter Verses, Gallaty creates a one-stop guide. One reality is for Growing Up is that it may have helpfully compiled discipleship processes from across the past 30 years and congealed them into this series of books. While GU has some great quotes to amplify the above, the person looking for new material or models should look elsewhere. The book doesn’t chart any new territory. It does offer some helpful and simple ways to teach things such as basic hermeneutics. Even so, it reads like it’s condensing and borrowing from other sources, such as Grasping God’s Word by Duvall and Hays. I'll be doing a book signing for Super Center Savior at the Lifeway Christian Store in Roanoke, VA on December 7, 1:00 - 3:00 p.m. If you're in the area, I'd love to meet you! It’s honestly a little surreal to know a New York Times best-selling author, much less be friends with one. Kiera Cass is the author of The Selection, The Elite and not-yet-released The One. She and her husband Callaway are leaders in our church, and recently Kiera produced a video for Staff Appreciation month that helped promote my book Super Center Savior. Our church’s Staff Support team (on which Kiera serves) identified that as a way to demonstrate their encouragement to me. It was a huge encouragement. Their idea was to sponsor a book drop in which they left copies of my book all over town in unusual places with a little note in the book that explained it was a gift and that it was hoped that whoever picked it up would enjoy it. Thanks to our Staff Support Team and Kiera for starring in, producing, filming and editing Book Drop. 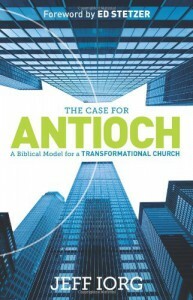 The Case for Antioch: A Biblical Model for Transformational Church is not a work that should only be read by students. Rather, it’s a book for practitioners. Whether you’re a small group leader, deacon, elder or pastor in your church, this is an encouraging book full of biblical insight. It’s worth digesting with a group, whether your staff or leadership team. Using the example of the church in Antioch in the New Testament, Iorg identifies seven characteristics found in that first century spiritual dynamo of a church that have significant implications for changing your church as well. Each of the above are dealt with in their own chapter. The ones I found to be the best are spiritual power, doctrinal convictions and strong leaders and followers. From the chapter on spiritual power, Iorg challenges pastors and ministry leaders not to succumb to being CEOs, and he points to the examples of the leaders in the Antioch church. They were led by the Spirit. "The spiritual responsibility to be a pacesetter is a normal expectation of pastoral leaders. Pastors, and others in related ministerial roles, are spiritual leaders. We aren’t primarily organizers or administrators. Our leadership skills are more than a collection of abilities and acquired techniques. We are more than speakers and motivators influencing people by charisma or intellect. We are spiritual leaders. We model what it means to follow the Spirit’s leading, to be Spirit-controlled, to be in biblical language, 'filled with the Spirit.'" The chapter on doctrinal convictions is an important read for church leaders and members. Iorg describes the conflict that almost split the early Christian movement between Jews and Gentiles and the resulting council that met in Jerusalem in Acts 15. They went to great lengths to defend and uphold doctrinal truth, and throughout the New Testament (and early church history) false teachers and heretics are called out by name in order to warn the churches. Today’s Christian culture lives in fear of offending false teachers, on the other hand. However, the maintenance of unity and doctrinal integrity are the responsibility of leaders. 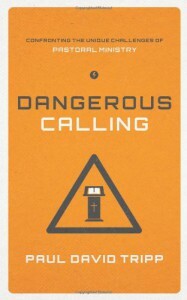 I can see how this book would be immensely helpful and convicting of ministry leaders. I enjoyed it, but it's lessons and message have been internalized in my life over time. Tripp counsels ministers to be real, to be authentic, to be vulnerable. I hurt for those who are still playing spiritual games and not aware of their desperate need for daily dependence on God. I would recommend this book, but with caveats. 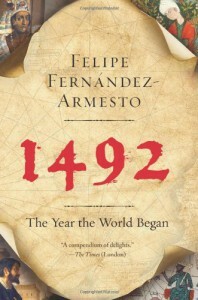 It’s not often that an author would’ve glad that I’ve read and reviewed his boring book. When I get to hash tag quotes from it as #boringbook, most would think I’m insulting him. Yet, this is the boring book that you will want to digest, and you’ll find it anything but. Rather, it addresses all the boring areas of your life and offers you profound solutions for recovering meaning and joy in them. 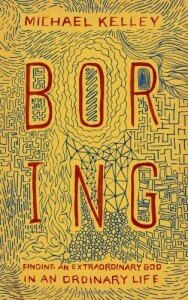 Michael Kelley’s premise in Boring is that even the most routine and mundane area of life – places where we’re tempted to overlook opportunities for significance – are actually moments of profound invitation for the Christian. Michael begins with the obscure story of pre-king Saul looking for some of his dad’s lost donkeys. It’s a tale that most of us zip by 1 Samuel 8. We read quickly because it’s, well, boring. And that’s why the book is sublimely powerful. As Michael unpacks this seemingly irrelevant incident, he reveals that what we often consider as mundane, routine and boring are not viewed as such by God. Rather, God is in process of doing something significant – in Saul’s case of providing Israel with its first king. For the rest of the book, Kelley provides chapter after chapter of seemingly boring areas of life in which God’s activity is profoundly present yet maddeningly obscure for those of us paralyzed by the familiar. Our finances are boring. Our work is boring. Some would say the day-in, day-out of kids, spouse, car, eating, etc are so mundane as to numb the soul. Click here for the rest of the review on my blog. 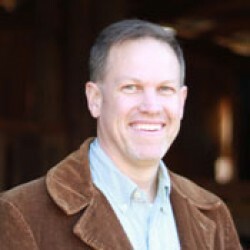 Brennan Manning is best known for his book Ragamuffin Gospel. He passed away in April 2013. There may not be another Christian leader better known for his simple eloquence and consistent advocacy of God’s reckless and beautiful grace. 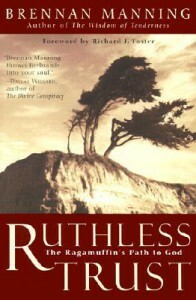 His book Ruthless Trust urges followers of Christ to dig their fingernails deeply into the cliffside of God’s love when life is tough and to simply trust. "You’ve got enough insights to last you 300 years. The most urgent need in your life is to trust what you’ve received." With wit and warm insight, Manning unfolds in the rest of the book the urgency and soul-freeing call to simply trust in God. Using ample scripture and stirring stories, he illustrates, teaches and leads the reader to stop demanding knowledge up-front and to release oneself into the loving hands of a God who cares more for you than you do for yourself. Check out the full review on my blog. The Giver was a powerfully intriguing book that hinted at humanity's past that was never revealed through the next two books. Gathering Blue seemed to be just filler that I hoped set the stage for a great conclusion in Messenger. 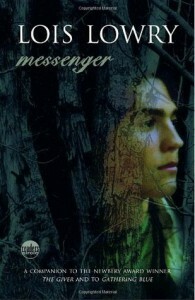 I found Messenger, however, to be completely unsatisfying, with plot twists that just didn't fit the overall storyline. The whole evil Forest thing was just too much. It's like Lowry lost her own way in the woods of this tale and couldn't decide what the world of the Giver, Jonas/Leader, Kira and Matty was at its core. Was it magical or naturalistic? Messenger pulled the story decidedly to the former. In all, what began for me as intriguing concluded with just silly. ""...you can't 'last minute' your way into living the Christian life. If there's no preparation or other daily discipline going on in your life, you will not stumble onto a moment of obscene faithfulness when it counts. You'll miss your opportunity. Even asking 'WWJD?' in the moment is not adequate, because you simply will have no idea of what Jesus would do."" We want Wal-God - a god who is one of our own making, who exists to serve us when we want and how we want." "
I'm giving away 5 copies of Super Center Savior on the book giveaway page! Enter to get a chance at getting one. Reviews are appreciated. i don't want Barnes & Noble to go away. In Blacksburg/Christiansburg, VA, they are the only bookstore around! But their Nook strategy was flawed. If you're looking for a quick but inspirational read about how to enjoy the Christian life rather than endure Christianity, this is the book! 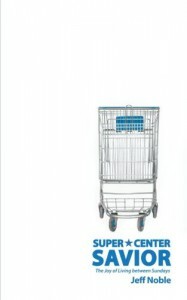 Released in December 2012, Super Center Savior will give you a fun, creative and challenging metaphor of the church in comparison to Wal-Mart. I've mentioned before the importance of reading "old dead guys." Too many Christians today are snacking on trendy preachers when they should be feasting on the proven preachers of history. Some who are popular and entertaining today are demonstrably heretics tomorrow. A good place to jumpstart your reading is here. A Call to the Unconverted is a deeply passionate, time-tested appeal to those who do not believe in Christ to thoughtfully consider turning to Him. It was written by English pastor Richard Baxter (1615-1691). It's the second book of his that I've read (see review on The Reformed Pastor). Baxter has been called the “Prince of Preachers,” and this book (one of his more than 168 works!) is a demonstration of his deep burden for the beauty of the bride of Christ, his careful articulation of theology, and his extremely practical approach to Christian living and leading. That should cover everyone, basically. Christians should read this book to stir or restore their hearts for a deeply passionate desire to see their family and friends, their neighbors and the nations surrender in faith to Jesus Christ. Baxter presents a convicting appeal to Christians to live like they belong to Christ. How else will those who have not yet trusted in Jesus hear the good news? Not-yet Christians should read this book and consider deeply the rational appeals of Baxter. He is penetrating in his logic and stirring in his love for those who do not believe (yet) in Christ. The not-yet Christian should not fear being brow-beaten into faith in this book. Rather, one will find themselves coaxed, urged and pleaded with to consider the offer of Jesus of forgiveness. If you are a not-yet Christian, and you've gotten this far in this post, first of all, thank you! Second of all, you may wonder why people like me (and Baxter) are so persistent in telling you about Jesus. Our culture tells you (and maybe you have chosen to believe it) that whatever religion makes a person "happy" is fine. That if a person finds happiness in Christianity, Buddhism, agnosticism, whatever, that's fine. Just be happy and leave the world alone. However, what if there is truth? What if one is right and the others are all misguided at best or evil machinations to keep you from the truth at worst? To see how near you are to hell, and we cannot make you believe it or consider it. To see how easily, how certainly you might escape, if we knew but how to make you willing... We study day and night what to say to you that may convince and persuade you, and yet it is undone: we lay before you the Word of God. And show you the very chapter and verse where it is written, that you cannot be saved except you be converted; and yet we leave the most of you as we find you. We hope you will believe the Word of God, though you believe not us, and regard it when we show the plain scripture for it; but we hope in vain, and labor in vain as to any saving change upon your hearts! And do you think that this is a pleasant thing to us? I appreciate Baxter's humility throughout the book. Even as he portrays the difference between "us" and "them" in regards to Christians and not-yet Christians, it's important for the reader and Christians to remember that the "us" was just recently a "them." We are not "in" because of our own merit. We are saved and forgiven because of the love of Christ. Christianity is not a country club of snobbish religious people. In its true form, its a movement of people away from sin and brokenness toward salvation and wholeness through a love relationship with Jesus Christ. 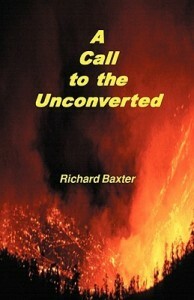 Baxter's book throughout blends gentle pleading with urgent demands upon both groups: Christians and not-yet Christians. What for him was normal Christianity in his passion to reach those apart from Christ might be considered "radical" today. The American church in particular needs to recover the loving and gentle heart of Baxter that unswervingly and clearly pleads with people to give their lives to Christ. His book conjures the image of a desperate man in the fog, waving a lantern on a road just before a washed-out bridge, pleading and warning travelers to turn back.